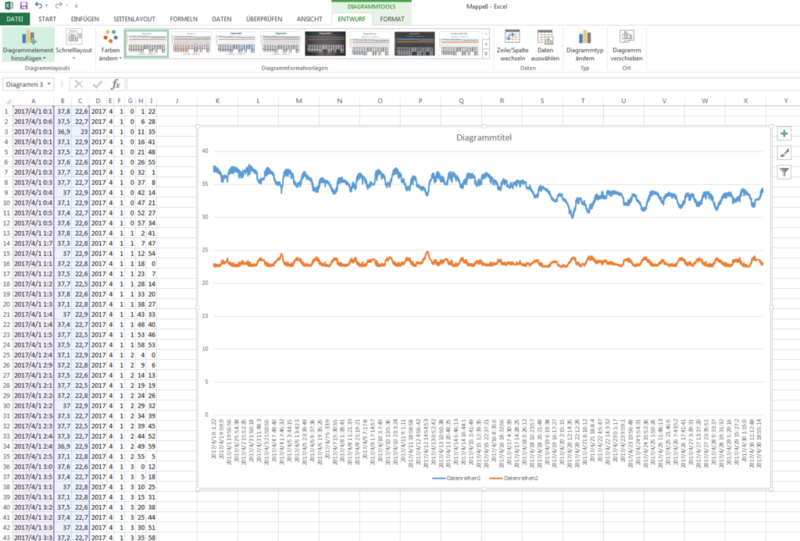 Instead of opening our “MyLogger.csv” (which would mess up the data pretty badly), we first create a new spreadsheet. Then we choose the “Data” panel and “from text”. We choose our file and hit “import”. We choose the option that we have “separated” values. Then we hit “next”. 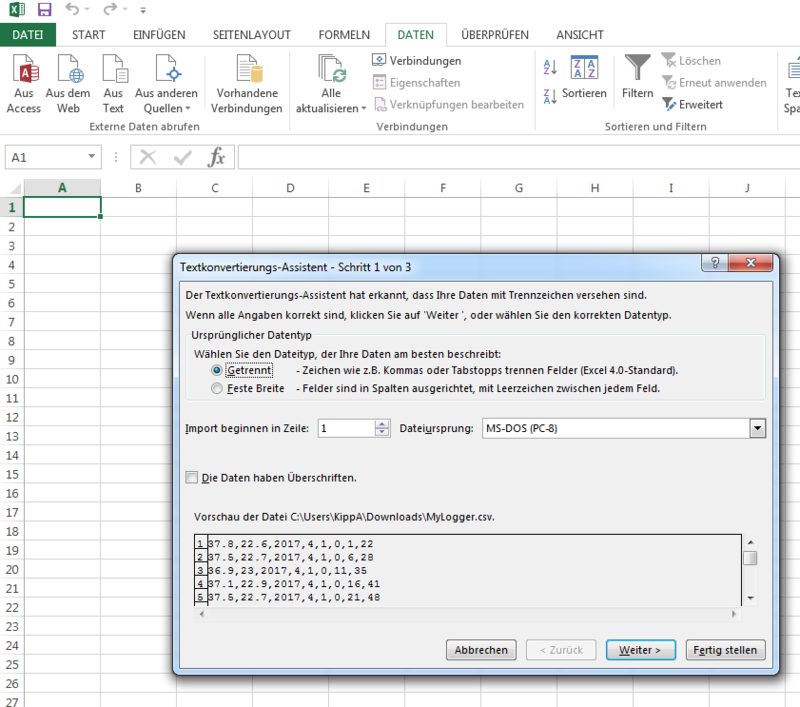 Our csv file in the preview window. The next window allows us to specify how our values are separated. In our case they are separated by a comma. As we choose “comma” the preview window shows us how it separates the values. After we hit next, we got the option to choose a format for our values. Easy to screw your data if you choose the wrong one. In most cases, you can leave it set to “standard”. 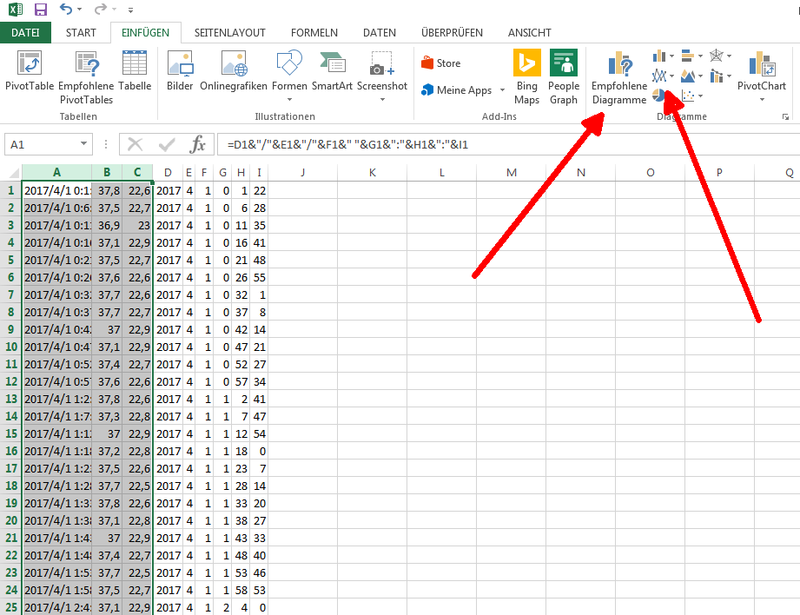 You can choose the format of the data in all the columns seperately. There is a special trick to shoot yourself in the foot if you are working with another language package than the English one. 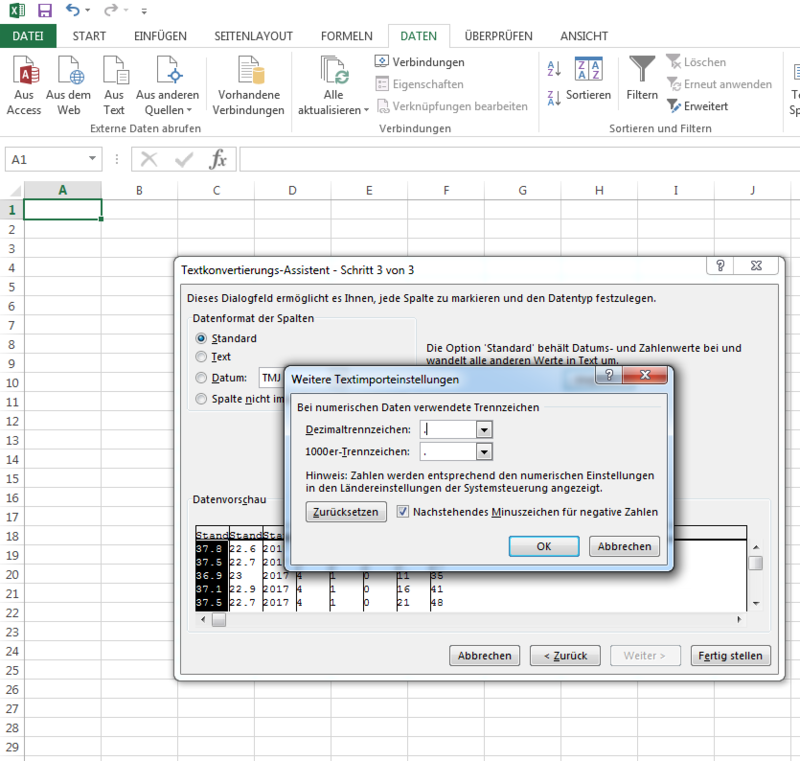 In German, the seperator for decimals is the comma, not the point. 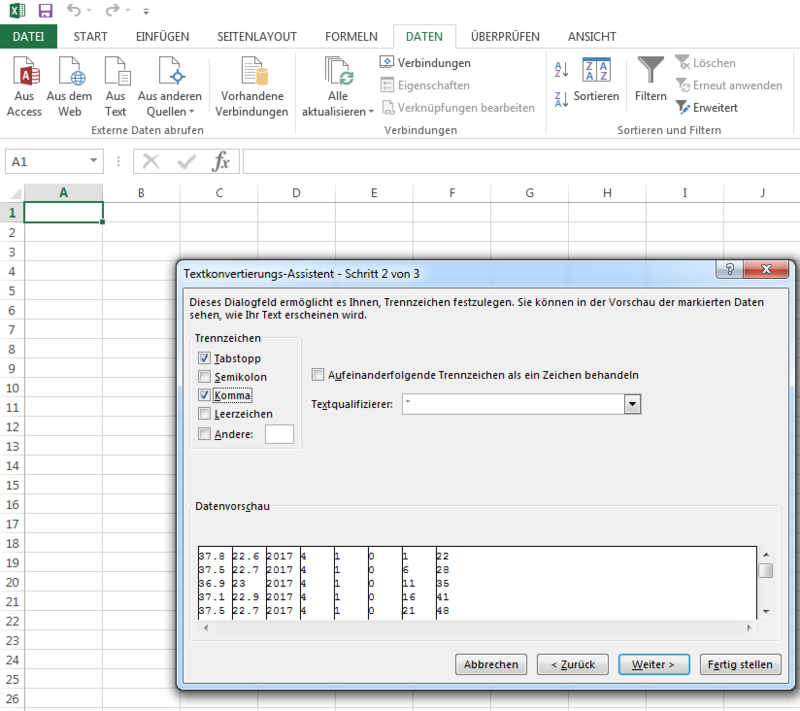 In the German language package Excel won’t recognize your decimals as decimals if you leave the “.” from the original software and do all kinds of funny things with them, like forgetting everything after the point or not interpreting your numbers as numbers. You have to choose the decimal separator for each column in the “Options…” field. Tweak decimals in foreign languages. 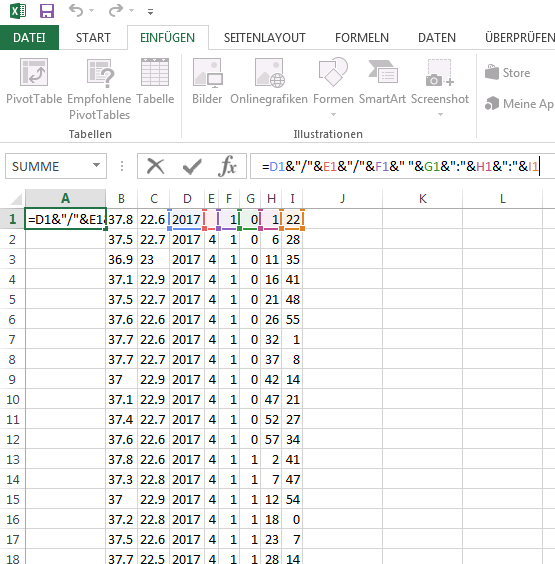 Creating a timestamp from data in columns D to I. Now we want this in our whole A column. We look how many rows of data we have, which in this case is 8484 rows, yours might differ. We now go to the address field, write “A1:A8484” and hit enter. 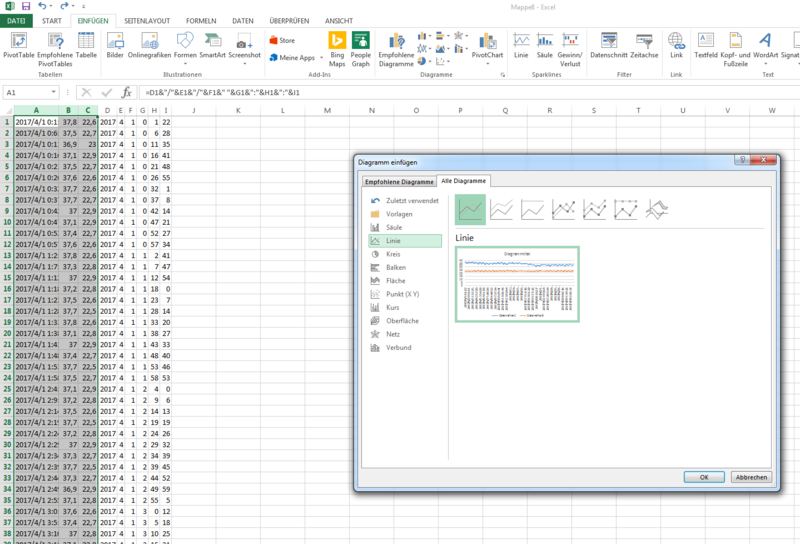 This tells Excel that we want to do something in all A fields from A1 to A8484. That’s why these are marked now. Next up we go to the “start” menu and choose the “fill” option on the far right of our screen. There we choose “down”. Now all our data sets have a nice timestamp made from columns D to I. We select all our A fields in the address field and choose the fill option. Ready to have a nice diagramm? Okay, here we go. You first mark the colums A to C which hold all the data we want to see in our graph. 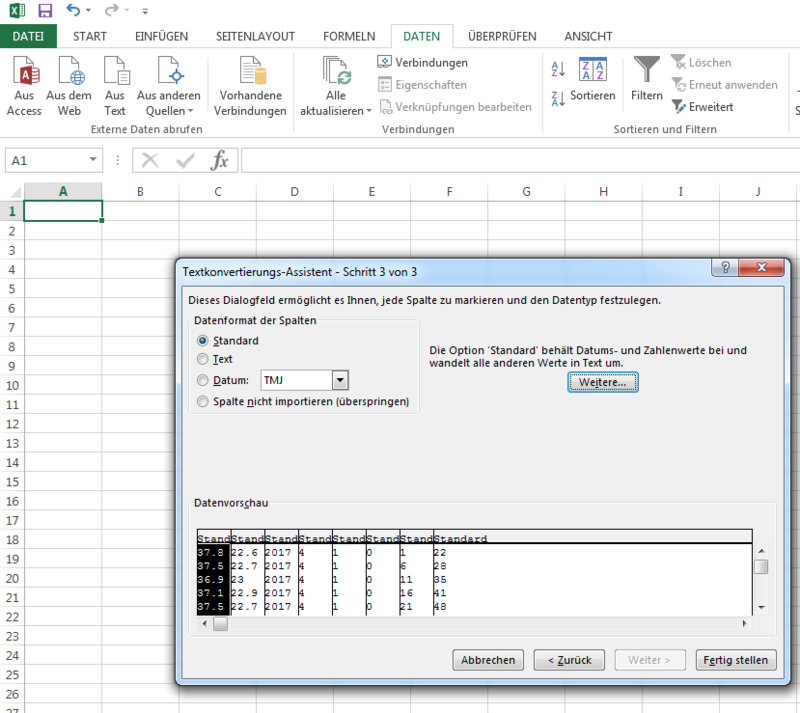 Then we choose the diagramm option from the “Insert” menu. You can either go to “recommended diagramms” or directly choose “lines”.